The main problem of blood donation isthat the blood is constantly needed, because not all of its components can be stored for a long time. On the other hand, the intervals between villas blood should be sufficient to prevent damage to the health of the donor. So you need a lot of donors who regularly donate blood or its components. The main problem of blood donation isthat the blood is constantly needed, because not all of its components can be stored for a long time. On the other hand, the intervals between villas blood should be sufficient to prevent damage to the health of the donor. So you need a lot of donors who regularly donate blood or its components. Most need for platelet donors, as this procedure is more time-consuming for the donor, and also can not be a donor platelets for too long - in the body accumulate substances used for the separation of platelets from the rest of the blood. In large cities, the need for blood donationsmuch higher than in small ones. This is due primarily to the fact that this is where the hospital where patients come from all over the area, and sometimes from across the country. The donor can also be a person with a local residence permit - this is due to the imperfection of the donor data base (regional base is not connected to a network). Taking blood from a random person is risky - in this case, it must undergo quarantine, ie stored for some time (from 3 months to six months), and only if, during this time the donor did not appear hidden disease, a blood can be allowed into the case. If the donor is regularly surveys the problem is removed. Who will need donated blood? When we ask such a question, in the firstYou think of all the victims of various disasters. But in fact, they just do not need the blood so often. More often, donated blood is required at delivery - and quickly enough, seconds count. But mothers do not consume so much of donorblood, as it would seem. 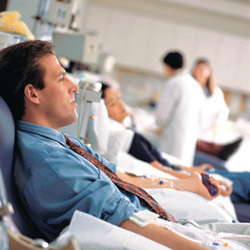 The main part is the treatment of those patients who need regular transfusions of blood or blood components. It is suffering from various anemia (Blekfana Diamond, Fanconi et al. ), Hemophiliacs, as well as those who are being treated by radiotherapy or chemotherapy. In hemophilia and certain anemias such transfusions should be regularly carried out for life - or rather life goes on, in fact, as long as there is an opportunity to receive transfusions. In other cases, the transfusion of blood components - part of the overall treatment, after which the person is completely healthy. our site finds it useful to talk about the donation, we will try to get rid of the fear of donating blood, because you, first of all, to provide assistance, it is necessary to treat it that way. With a blood donation due many heroicstories. For example, during the siege of Leningrad Leningrad Institute of Blood Transfusion for a single day did not stop their work. The only concession was wartime transition to harvesting only the first group of blood - it can be transfused to all groups, which greatly simplifies the pouring in frontline conditions (do not confuse). 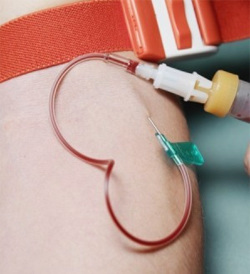 Donor put two weekends - the day of delivery of blood andanother day of recovery, while maintaining wages - and if you have to surrender to the weekend or for whatever reasons, the donor goes to work, then these additional output transferred to the date of the donor's choice. The blood can be taken in several ways. The fact that the patient does not usually transfused blood "as is", and certain of its fractions - what you need in this particular moment. In all cases, blood is drawn from a vein in the arm, if some blood components are returned, they may be returned either in the same hand or the other. You can actually take whole blood - Then the doctors themselves will understand what to do with it. For just one donor take 400-500 ml of blood. Can pass platelets - The procedure is more complicated. The first day of the need to pass inspection (before that you can not eat anything from the donor to the analysis take 30 ml of venous blood). The next day, or the need to undergo the procedure of blood donation itself (one and a half hours on the machine, which takes blood from a vein, it filters out of blood platelets, and the rest is returned to the donor, take only 450 ml of platelets). 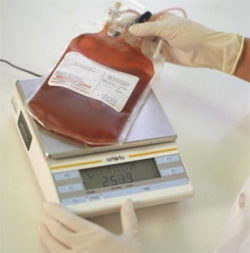 This method is designed to be able to provide the right amount of patient platelets is collected from a single donor - by mixing donor blood products having several additional problems. 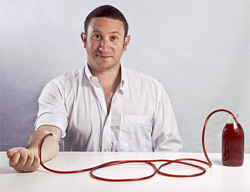 A survey carried out in advance for the collection of platelets in a sterile disposable device is charging kit (needle-hoses, containers), and such sets are quite expensive. There are two fundamentally different ways of deliveryplatelets: intermittent and hardware. our site considers it useful to clarify the difference between these two methods. 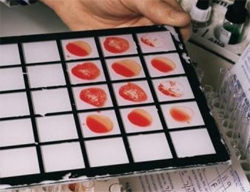 Intermittent trombotsitaferez is shown that the first portion of the blood platelets are removed from it, and the rest is filled back to the donor, then the procedure is repeated. 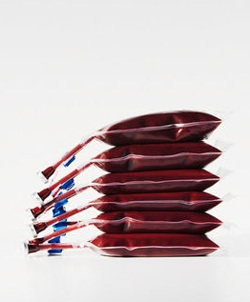 In the second case, the process takes place almost continuously - of one arm shown in the blood, passed through the apparatus, and then poured into a vein of the second hand, the process is continuous. Actually the second version is better in every way, but it requires a more complex system, which, unfortunately, have not all blood transfusion stations. You can take apart blood plasma - About the same procedure astrombotsitofarez, only without the prior survey, and on the other machine. The blood circulation back particles and the plasma is in need. dose blood for 1 time - 400 ml. Even more exotic option - Deposit of granulocytes - Derived leukocytes. This kind donations are usually made out of necessity, because granulocytes are not stored for more than 24 hours. On the eve of the donor makes an injection of a special medication, granulocyte stimulating output in the blood, the next day the procedure is carried out with a similar platelet surrender. The granulocytes are necessary for those who currently severely weakened immune system (as a rule, is the result of chemotherapy) and should be transferred to the recipient within a day, or transfusion will not bring the proper result. How and where to donate blood? 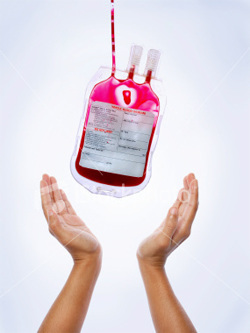 There are special blood transfusion station,nearest to you is easy to find on the Internet. Regularly held shares at blood collection, in this case are all the coordinates and the donor almost the handle are in the right place. With a need to take a passport or military ID withresidence permit on the territory of the area where you are going to donate blood; You can grab a medical card (optional). Women in the case of suspected pregnancy is better to refuse blood donation. It should also be borne in mind that the blood normally passin the morning (between 9 to 11, time to be confirmed) - is in the interests of both donors and doctors. Donor - because in the morning the body responds better to blood loss, doctors - because blood is not enough to get it you need to also handle for storage. 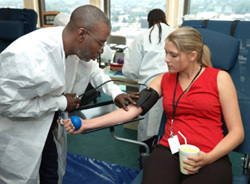 Before giving blood you need to undergo a medicalexamination, blood donor, it is completely free. The examination includes examination of the therapist (in front of each cottage blood), clinical and biochemical blood test, a blood test for hepatitis, HIV, syphilis. our site Please note that the testsBlood transfusion is required to take place at the station, make them in any clinic and can not bring help. Analyses take a day or two, to avoid wasting expensive disposable system components, sub-standard. The first time is also determined by the group and Rh factor. Blood - it is a sign, which is transmitted bysuccession. It is individual for each person a set of specific substances, called group antigens. It does not change throughout a person's life. Depending on the combination of blood antigens divided into four groups - O (I), A (II), In (III), AB (IV). Blood groups were found in the XIX century. 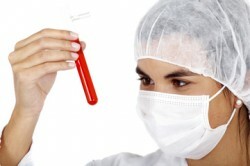 Before each subsequent blood test is conducted in order to avoid re-infection of humans, which this blood is transfused. age - the bottom bracket 18, upper abolished, a decision accepted by the doctor in each case. AIDS carriers of HIV, syphilis, viral hepatitis, tuberculosis, Brucellosis, typhus, tularemia, leprosy,toksikoplazmoz, hydatid disease, trypanosomiasis, filariasis, guinea worm, leishmaniasis, malignant tumors, blood diseases, organic diseases of the central nervous system, the complete absence of hearing and speech, mental illness, Drug addiction, alcoholism, hypertension 2-3 tbsp., Coronary heart disease, arteriosclerosis, atherosclerosis, atherosclerotic cardio, endarteritis obliterans, nonspecific aortoarteriit, recurrent thrombophlebitis, endocarditis, myocarditis, heart disease, bronchial asthma, bronchiectasis, pulmonary emphysema, obstructive bronchitis, ahilichesky gastritis, Gastric ulcer and duodenalulcers, chronic liver disease, including toxic nature and unknown etiology, calculous cholecystitis with repeated attacks and events cholangitis, cirrhosis, radiation sickness, diseases of the endocrine system in the case of functional disorders and metabolism, severe nearsightedness (6 L and more) , trachoma, blindness, generalized psoriasis, erythroderma, eczema, pyoderma, sycosis, lupus erythematosus, bullous dermatitis, fungal skin lesions (mikrosporiya, trihofitia, crusted ringworm, athlete's foot) and visceral (deep mycoses), pustular skin diseases (pyoderma, furunculosis , sycosis), osteomyelitis, acute and chronic, undergoing surgery with removal of an organ or organ and tissue transplantation. if you are in contact with patients with hepatitis A, this point must pass more than 3 months; patients with hepatitis B and C - more than a year. if you have a tattoo or you were treated acupunctureThen you can become a donor one year later (in fact, to identify possible infections quite 6 months, but it is written in the Law). since the last feeding of milk has been more than 3 months. from the date of reception of alcohol should go through 2 days. For returning from abroad, there are alsotime constraints, it is connected again to the need in time to identify possible diseases (if any). For samples abroad for more than 2 months to donate blood is only possible in half a year. Well, if the route was a country where the disease is common as malaria, the donor is allowed to donate blood not earlier than 3 years. First of all it is important to remember that before deliveryblood need to eat accordingly - at least two days to eliminate fatty, fried, smoked, spicy, milk, eggs. Drink plenty of fluids, but not alcohol (beer also considered an alcoholic beverage). Do not take drugs, especially aspirin and analgesics. At least one hour before the blood cottages smoke. And be sure to get enough sleep. At the station transfusion need to come on an empty stomach. Actually the procedure of blood donation begins withmedical examination (measures the blood pressure and heart rate, blood is taken from the finger hemoglobin) and filling in the questionnaire donor. 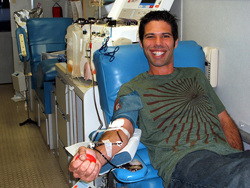 Then, the donor goes into a special account to donate blood and settles in a half upright position on a chair-couch. The hand (or two hands, depending on how the donations) alcohol wipe the inside of the elbow, pinch above the elbow and asked to "shake the pump" fist (can give something in his hand and ask for compress-decompress) to find a vein. the needle is gently inserted into a vein (disposable, printed by the donor), it almost does not hurt. A needle and a portion of the system is attached to the arm with adhesive tape, to the donor did not hurt his hand a careless movement. During lengthy donor procedures canleft alone, periodically coming to check it, but those who came for the first time, so try not to do that. And usually there are a number of other donors, who will call the doctor in case anything happens. 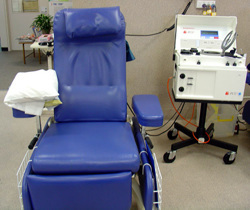 Sometimes they offer in the delivery of blood to see the movie, but usually at stations just do not have such equipment. It makes sense to take a player (not the book, as most likely both hands are busy). All the process has begun. Usually take 400-450 ml of blood (or desired fraction). Letting of whole blood takes 5-10 minutes, trombotsitofarez - 1.5-2 hours, delivery of granulocyte - about the same as a plasma - 40 minutes (this time actually on the procedure, transfusion stations will have to spend some more time - medical check up, rest after ). Once taken everything you need (and merged back into the bloodstream is all you need), a nurse put a bandage on his hand and a reminder that it is not necessary to wet the wound over the next few hours. Usually, after a couple of days leave no trace, in the case of complications can always call on the same blood bank and ask what to do. After the blood donation procedure, our site is not advisedhurry to leave the station - it is better to sit quietly for a while to calm down the body, and if you suddenly feel dizzy, it is better to be near the doctor-nurse, who know that with you. In parting, you need to take help of a gratuitousdonation (required for registration of the weekend at work), if it is possible - not in a single copy (alas, the reality is that if you suddenly become bad in the street or in public transport, and even with fresh tracks in the veins, in you probably suspected drug addict than the donor). 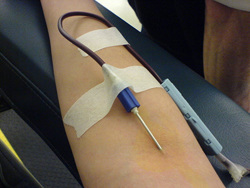 If you give blood to a specific person - you need to make sure that this was also reflected in the reference (in this case, their exact needs at least 2 copies - one you give the doctor treating the person to whom you are helping, and her doctor will get blood for the patient; and the second show your employer). Also, you are entitled to a voucher for food. At issue will explain where to use it - usually at transfusion station has a dining room, a snack bar or something like that. How best to recover from blood cottages -You will be told at the point of delivery. Basically it is a minimum of exercise, quality nutrition, plenty of fluids and, in general, a healthy lifestyle. The feeling when enough individual donation. The pain of a needle in a vein is almost imperceptible, but if you still have a fear of pain, you can come half an hour early and have anesthetic ointment (she does not act immediately, because of such extra time). 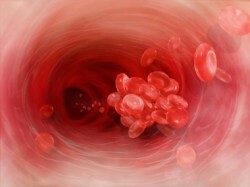 Upon delivery of the whole blood or red blood cells may be dizziness. Delivery of plasma leads to a mild euphoria. Upon delivery of the platelets can be feltfreezing - a side effect of using CTrunk when platelet separation (applied to the blood is not curled directly into the system), which leaches calcium. In this case, you need to tell the doctor, he will make an injection of calcium gluconate and wrap up your blanket. Sensations from such a prick - heat wave, heat, improving mood. Upon delivery of granulocyte no special feelings, they all fall on the preparation phase - when the organism strenuously produces white blood cells. Pass the same way as the initial stages of colds. But again our website recalls that everyone infeeling alone after giving blood will be different. In most cases, health donors remains within normal limits, recovery time is minimal or not required, the state is quite workable. After passing the blood (platelets, red blood cells orwhole) must be at least 60 days before the next blood cottages or 30 days prior to giving blood components. It is recommended after 4-5 cottages to take a break of not less than three months - to recover. The total amount for the year, whole blood is allowed to take no more than 5 times. 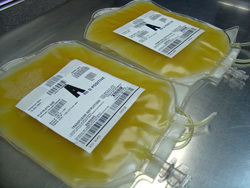 After passing the platelets must pass two weeksor more of the following delivery to the blood or its components. Similar deadlines are set at the recent plasmapheresis. The rate for plasma deposit, which must not be exceeded - up to 12 times a year. If you passed the granulocytes, you can come to the point of giving blood 14 days for delivery of plasma and platelets, and 30 days - for delivery of whole blood, and granulocytes. Hangover: there is a solution!